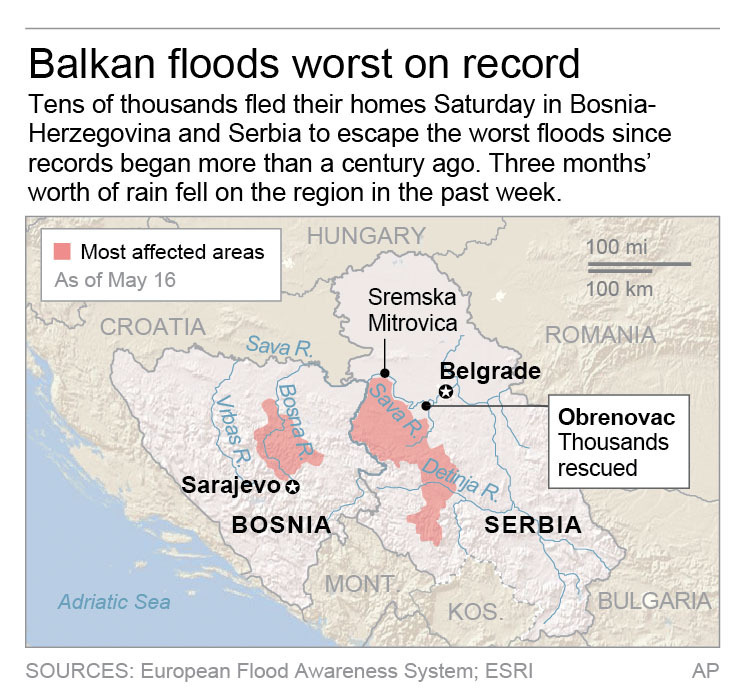 Home / News / How did the Balkans receive three months worth of rain in four days? 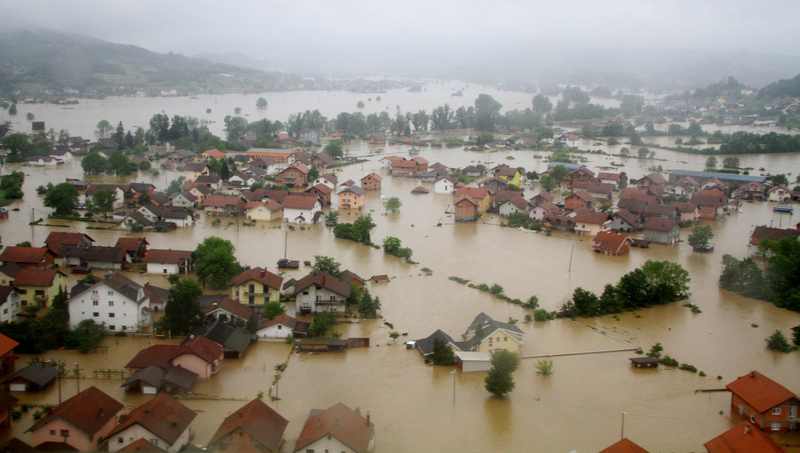 How did the Balkans receive three months worth of rain in four days? CNN has reported that the Balkans have been hit by the worst floods they’ve faced in the past 120 years. Simultaneously, land mines from the Bosnian war are resurfacing. “There are reports that landmines buried during the conflict and not yet removed are in some instances shifting with the landslides, adding (to) the dangers of people living in the areas as well as rescuers,” said a representative of the American Red Cross in a statement. 26 bodies have already been discovered since the rain subsided and flood waters have begun to recede. CNN meteorologist Pedram Javaheri, predicts flooding will last at least another week and thinks in some areas of the region it could get even worse. This meteorological catastrophe has caused a downpour of more than 100 millimeters of rain on the Balkans in only a few days and has left rivers swollen and towns underwater. The Balkans experience a weather pattern called a “cutoff low”, a cut off is similar to an eddy in the curve of a river that becomes isolated from the main current. A cut off low begins as a dip (trough) in the winds known as the westerlies. When one of these becomes cut off from the main westerly flow, the closed circulation can last from two to three days. In the case of what happened in the Balkans, the cut off low lasted up to four days and in that time three months worth of rain was unleashed in the region. The existence of these cutoff low patterns occurs most commonly in southern Europe. Some regions however are affected more than others. Rivers in the Balkans also represent the central supply of fresh water. “High water levels also contaminate water drinking plants leaving thousands without drinking water, “Ramos explained. In Serbia alone more than 24,000 people have evacuated to escape water that is chest high in some areas. In Bosnia it is estimated some 30,000 have been evacuated. Another issue besides the rising water are the people in Serbia who are unwilling to leave their homes. According to another news report, help is on the way. The World Food Programme said it plans to send food assistance to more than 150,000 people in Bosnia’s most affected areas. The organization is also sending food supplies for 7,000 people in Serbia. Matt Robertson obtained a BA in History from the University of North Carolina at Greensboro and an MA in Museum Studies from Morgan State University in Baltimore. Robertson's a major sports enthusiast, avid golfer, passionate Jets fan and enjoys surfing. He's also a talented barista. Follow him on Facebook/MattRobertson and on Instagram @gingerbeardedbarista.